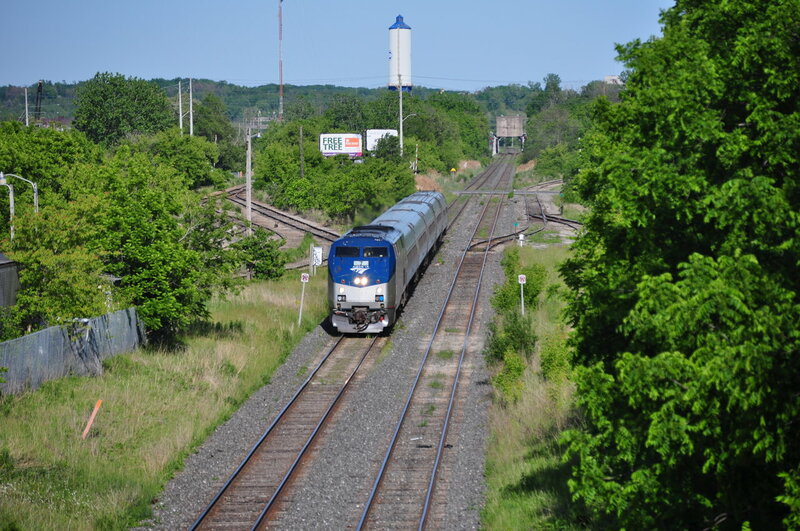 Railpictures.ca - DoctaPinklaces Photo: Here’s one for the time machine. This photo was a bit of a struggle to take, considering how much the area has overgrown with weeds, light angles, and trying to match the same angle that Mr Mooney had shot at (that bridge was replaced in 2007). Although not a fancy steam engine, this train is the last daily passenger train in Niagara. One will notice how much greener the area has become since, as well. The station seen in Mr Mooney’s shot was burnt down to the ground in 1994 (? ), and the freight yard is only used by Trillium occasionally now a days. The only thing that sits in there full time now is MOW equipment. To see Mr Mooney’s original shot, click here: http://www.railpictures.ca/?attachment_id=14794 | Railpictures.ca – Canadian Railway Photography – photographie ferroviaire Canadienne. Copyright Notice: This image ©DoctaPinklaces all rights reserved. Not even 20 years ago Merriton was crazy busy still…all the locals to and from the freight yard, and you had way more lines…Port Spur ,Lakeshore Spur, Townline Spur…I miss those days. Greener doesn’t necessarily mean happier unfortunately. The lack of activity is pretty depressing. Crazy how dramatically this place changed in a little under 35 years.